Come Monday morning the much talked about cricketing citadel of Sri Lanka will be headed by a new administration replacing the much-maligned administration of spinner Dandeniyage Somachandra de Silva who almost managed to run the game in Sri Lanka aground. 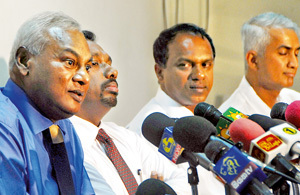 Maybe the term of the new team headed by former Cricket Board president Upali Dharmadasa is limited. The International Cricket Conference which has had enough of these politically-loaded cricket administrations has called on cricket boards to hold elections and come up with cricketer-represented administrations. However the new team has some eight months to put the runaway cricket train back on track and make the game in Sri Lanka count again. The canker in cricket in Sri Lanka has seeped into the very core. There is no piece of the game or its administration that is standing tall. There is corruption and mismanagement down every ally and the task ahead of the new management is huge and we in the next one thousand words are trying to spell out some of them for their perusal. Our cricketing ego had taken a kind of a plunge the other morning as England had thrashed Sri Lanka by more than a hundred runs in spite of a rain curtailed game. Suddenly a friend who had just returned from the Queen’s Land blurted, “There is mutiny on the Bounty. There is a huge split in the Lankan team playing over there”. It was just the kind of confirmation we were looking for. While watching the Test matches on the screen it was more than evident the Lankan team spoke in two dialects though wearing the same gear and was involved in the same game. Is this the irony of the times or a cascade of occurrences that evolved through the last few years mainly as a result of the bad management that held the reins of the game in this cricket crazy island? The friend was saying half the team involving the youngsters and some of the fast bowlers were in camp ‘C’ while most of the seniors and others were in camp ‘FC’. Yet the split in the side also has many faces. One is their allegiance to the player managers. The story goes to say how a certain player manager prompted a certain selection committee chief to release names of an important team selection so that it would facilitate the IPL barons to pick on names mainly from the cricketers who were on that important list. They say many of those on that list came from the ‘FC’ camp that belonged to one particular player manager. Now that the ‘C’ group is stronger, many from the ‘C’ group are preferred over those from the ‘FC’ camp. The C versus FC division was in place earlier too. A then C camp member, now in the FC camp, confided some two years ago with the Musings about the mutiny that he had to tackle from a group of cricketers who were then senior and also had the present leader of the ‘C’ group as a member of the clan.No wonder even a team which is far superior than the English side at least on paper managed to lose a rain curtailed game by more than a hundred runs. That is one face of this multi facetted case. Then for the first time a Lankan cricketer — Upul Tharanga was proved to be under the influence of banned substances. He initially said that he was under treatment from medical practitioner Eliyantha White and he was not aware of the nature of the drugs given to him. May be that was one of the prime reasons that he got off lightly with a back dated ban of three months. Yet the whole country knows Tharanga was not the only sports person who sought treatment from this practitioner. White says he did not administer any banned substances into Tharanga’s medication and also adds that Lasith Malinga and Thilan Samaraweera who also came under his medication would have been detected in that case. Probably, White does not know that the tests are done at random by officials of the World Anti-Doping Agency. Meanwhile the Sunday Times reliably understands that the national cricketers took treatment from White with the blessings of the Sports Ministry Medical Unit chief Dr. Geethanjana Mendis. However when contacted by this newspaper he refused to comment, but did not deny the report either. If this green light was give for national cricketers to get treatment from White, under what criteria was it given and what medical qualifications does White possess to treat these national cricketers officially? The authorities could bring in some new regulations after close scrutiny and close even the slightest opportunity or loophole and may be even hold both parties responsible if such occurrences repeat in the future. Sri Lanka is trying to make an earnest bid for the 2018 Commonwealth Games. Then we feel that it is high time Sri Lanka got rid of this dope menace and clean up the already tarnished sporting image of the country. That is another face of this multi facetted scenario. Coming back to cricket, we just heard the other day Stuart Law who was elevated to be the Lankan coach at least for their stay in England suddenly drops a bombshell saying that he is running off to Bangladesh to take up job as the National coach there. His sentiments were that the Lankan management was not giving him the concrete assurance in spite of the authorities being in search of a national coach to take over from Trevor Bayliss. Even Bayliss once shedding the Lankan cloak off his body came up with a verbal tirade against the state of the national cricket at present and accused those involved with the game of being involved more with the things outside the boundary line than what was happening within and wondered how the cricketers kept performing at that top level in spite of all that. When statements of this nature are blared to the entire world through the media one wonders if the top grade coaches would throng at the gates of Sri Lanka Cricket at Maitland Place and keep demanding for the job on offer. That is another face of this multi facetted narration. From the moment it was announced that the SLC was going to have the World Cup secretariat the question was who was going to man it. Once it was named the stories from within those hallowed halls began to leak out, accusing that the structure of the system was fragile and siphoning could take place. Then once the World Cup tickets were out there was a television station which brought out live a crooked deal that transpired right in front of the SLC headquarters, but nothing further happened. The tumble train stayed on its rail. The ticket story came up again and this time it was the hard disks of the World Cup Secretariat computers that took a walk. Then there are allegations about the T-shirts and other allied paraphernalia going on the wrong path and a World Cup souvenir which was printed at a colossal cost being brought to the secretariat well after the tournament was over. These are some of the matters that will have to be probed by the new Interim Committee. Doctor what supplements can I give my child?